« What Does the Book in Her Hand Mean? Here is another photo from the box of my family photos. Now this photo begs the question: was she actually a member of my family? I have found photographs in our collection that are not of relatives. I wrote earlier about Tom Richmond and his family, neighbors of my relatives. Tom was the butcher. Also, we have a photograph of Dutch Arnold, the saloon keeper. There are no clues on the photo. Grandpa didn’t know who she was, but it’s likely that she was from Kalamazoo. I would love to have someone claim this photograph of their relative!! Any clues you can see in the photograph? Am I correct in assuming that she is African American? It’s hard to tell from the photo. Was there an African-American community in Kalamazoo back then? If so, what was the principal occupation of that community? Amy, she is African-American. There has been a Black community in Kalamazoo for a long time, I’m pretty sure. Here is a link to information about the history of Kalamazoo’s African-American community. http://www.kpl.gov/local-history/black-history/ When I went through this photos in the early 70s with my grandfather he suggested she might have been a maid to someone in our family. He mentioned her plain clothing. I didn’t put this in the post itself because I wasn’t sure if his guess was based on knowledge of the period or if it was nuanced by bias. 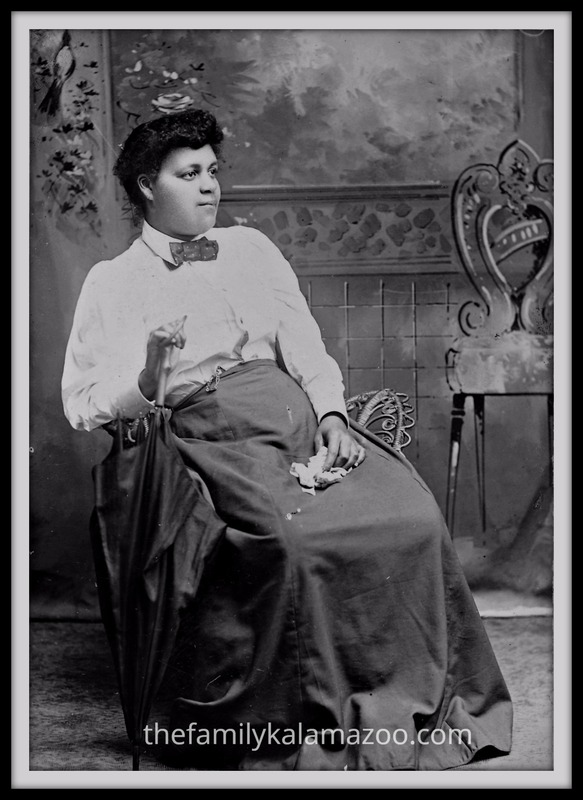 I have recently seen quite a few photographs of Black women from the time period who were wearing more glamorous clothing, so there is something in what he says about her blouse (shirtwaist? ), skirt, and tie. I also don’t see any jewelry. I had the same thought—thus, my question about the occupations of the A_A community back then. I also was afraid I was making biased assumptions thinking she was part of the household “staff” in some way. Not having lived back then and since history has so often shadowed or erased African American “local history,” it seems impossible to know today if that is a fair guess based on her attire or if she might have even owned a shop in the neighborhood. 1) she has a very happy, contented, peaceful look on her face. 2) her shoulders are twisted, and she is leaning towards the left in the photo (her right). She appears to be propped up, or supporting her left side with an umbrella. Perhaps her back is hurting or she’s disabled, or has an injury which makes her appear disabled. There’s also an ‘outdent’ in her dress behind the umbrella, as tho there was a wheel from a wheelchair under her dress. However in checking the other side, it could be just the chair she’s sitting in. #1 and #2 don’t jive! There’s just something about her pose that makes me think she is crippled or immobile yet she looks so calm and serene. Wow, I hadn’t really considered that she was a little lopsided. Here is what I was thinking: I recently saw on TV that even in the teens they were propping people up to photograph them. I thought this was an attempt at a more “natural” propping, by using the chair arm and umbrella. That would account for her having to twist her body a bit and making her uncomfortable. However, the one last clue that makes me think you might be right is that her smile is straight across, although her body was angled. That would happen if the photographer was shooting her from the angle in order to hide a side of the body that had been disfigured in some way, perhaps from a stroke, although she certainly seems young for that. Thanks for the great attention to details!!! Either a friend of the family or a relative by marriage. Something to consider: this might be a photo the woman gave to your family as a gesture of friendship for remembrance sake. Not every photo in a collection was taken by a family member. I don’t see any clues but the background looks like something from a studio. EmilyAnn, I am going to keep an eye out for this studio in other photos, although I don’t remember seeing it. Your idea that she could be a friend or relative by marriage is very possible. I do know that there was at least one Black family in my mother’s neighborhood. I’m not sure at what date they moved into the house, but the families were friendly. However, if she were related to them, my grandfather would surely have known. The other thing is that there was a relative who I believe was married to an African-American man for a short time. It is possible that she could be related to him. I haven’t had any luck so far in locating any info about him (other than his name, which was quite common at the time for both white and Black men). 1. She is African American or mixed race (half black, half white). I am leaning on the latter for her complexion and the loose curl of her hair. 2. What is in her hand? It seems odd that these items were used as props. 3. She does seem to have a disability, it is as if one side of her face is paralyzed. Maybe I am jumping too far into this, but a mild stroke or a mild form a cerebral palsy. One side of her face is smiling, the other side is not. 4. Is she with child? But her stomach drew my attention as well. 5. Perhaps she was a family friend or a neighbor’s child. She could as it has been also stated held a domestic role. Who knows? Have you seen this backdrop used in other images? Christina, great observations here! Good point that she could be biracial, something I hadn’t considered. I think it’s her handkerchief in her hand. I found that odd, too, unless it was symbolic in some way or if the photographer thought it made her look more natural or made her more comfortable (as if she was used to holding it). I just enlarged the photo and really examined the umbrella. Did you happen to notice that it looks as though it is attached to the chair in some way? As if there is a hook or other metal attachment there. Very odd. Maybe the photographer set this up on purpose to use in place of using a traditional stand that they used to keep people still during the long time it took to take the pic. I didn’t even notice that about her face until pastsmith mentioned her body. Then I could account for her body being “lopsided” because of leaning on the chair and umbrella as a prop, but I noticed that her mouth is straight, while she is angled, which could signal a health issue. I hadn’t thought of cerebral palsy, but something like that is possible. She seems too young for a stroke, though I know that that can happen. It seems so unlikely that she would work as a domestic if she had a disability like that, doesn’t it? I noted above to EmilyAnn that there was a relative who married an African-American man and they were divorced pretty early on so there is very little info about him. I did locate his name, but have been having trouble really finding any meaningful information about him. It is always possible that this woman is his relative. I don’t remember seeing this set before, but I will keep an eye out in case I do. A lot of my relatives were photographed by studios owned by Dutch photographers, but not always. Maybe this portrait was done by an African-American photographer, maybe not. I so wish the name of the photographer was on the back! I too wonder if the lady is leaning on the umbrella. But the photographer could have put her in a more comfortable chair if she was disabled. What really jumped out at me is the little chain at her waist. This seems to be attached to a pair of glasses, perhaps reading glasses, so reading or doing close-up work (such as needlework) might have been important to her. WJ, your comment about the chain at her waist made me enlarge the photo and examine the details more closely. Good call on your part. You think it’s glasses, not a watch? I don’t see any glasses, so was thinking a watch? Look at an enlargement where the umbrella meets the chair. I think the umbrella may be connected to the chair. What do you think? Read what’s been written above about the possible disability. What do you think? How about a magnifier if not glasses? She doesn’t look old. I am wondering CP or stroke as mentioned above in relation to her face being a bit crooked and the wadded hankie. Could she have been pregnant and very uncomfortable? It’s possible, right? She does seem heavy, though, in the face, so maybe it’s just weight. Or maybe she just hates sitting still so long! I would have hated it! I’m not a doctor so I refrain from diagnosing a person’s physical health based on one photo. Clothing in that period was so constricting. As a larger sized woman she just might have beeh uncomfortable in a corset if she was not pregnant. Also, we do not know what the weather was like on the day the photo was taken. Overall, she looks like someone you could approach, very down to earth. Yes, very down to earth and very forthright looking. I wondered if it might be warm and that was why she happened to have the hankie in her hand. Maybe she had been wiping her face. The hot day, the hot heavy clothing, the hot lamp for the camera . . . .
on March 11, 2015 at 8:03 pm | Reply Sammy D.
Such great comments and observations from everyone, Luanne! What first caught my eye was the bow tie (it almost looks pre-tied, but I don’t think it would have been in in that early era). I wondered if that signified a position in a household or as a nanny. She has lovely eyes and does seem to mix serenity and possible discomfort – either clothes, heat or a disability. I agree that she looks like she has had a stroke, and that is an odd chair. I may be reaching with this thought, but if her mouth hung on the left, and the hankie is in her left hand it may have been something she held to wipe her mouth? What were the illnesses of that era that could have caused paralysis? Was polio around then? I know TB was a problem but would that cause a physical handicap??? Also- I would be she is NOT pregnant. I would be surprised if a pregnant women would have allowed herself to be photographed accenting the baby bump, (especially without a husband in the photo as well) and maternity clothes would have been loose and flowy not tucked in. As a photographer I would suggest you not put too much into the distortions in the photograph. At that time, exposures were very long so people had to sit still for a very long time. I have a picture of my grandfather in which he appears to have several thumb shadows indicating movement during the exposure. Look at her ear. I see what appears to be a slight image of the ear beside her ear. Her jaw appears to be clinched which may be how she attempted to sit still. Notice some things are in sharp focus while others are a bit blurred. She appears to have a set of ghost lips, too, which makes the image distorted.it is definitely a studio photo, because of the painted backdrop.